The 1st Edition of Inspire Cup 2019 U-17 Youth Football Competition, an inter-school boys’ football tournament was kicked off on Monday. The tournament, held at the Kodombokpi Ground Sports Complex, Wangjing in Manipur, is being organised by Oorep Sports in association with Heerel Studio. Manipur Education Minister Thokchom Radheshyam while attending the opening function said Manipur is a land where sports are an integral part of the people. Although a small state, Manipur has brought many laurels for the country in the international arena. The minister stated it is a pride of the State that eight Manipuri players were part of the FIFA U-17 World Cup 2017. He also said sports demand professionalism and football today is being played as a profession in the State too. Many clubs have come up in the country and in the State as well where professional players are playing with better facilities. Radheshyam stated the football competition for the players under 17 years will provide a platform to the youths, who are sports enthusiasts. He appealed to the guardians and parents to mentor the young minds and not to pressurise them but to let them grow and develop their innate qualities. Announcing the opening of the football competition, the minister said, “Playing well is as important as becoming the champion” and urged the players to play fairly abiding the rules and maintaining discipline of the game. 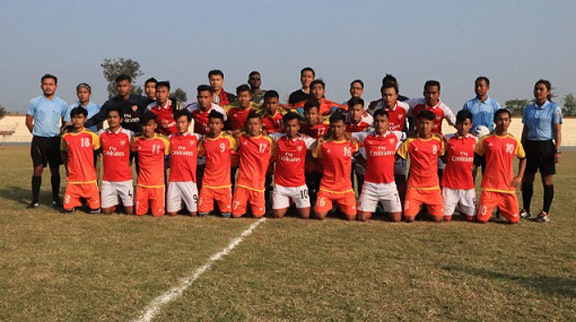 C. T. Higher Secondary, Mayang in Imphal won the opening match against Endeavour Football Club, Wangjing by 4-0. The U-17 Youth Football Competition, played by 22 teams of different higher secondary schools, will be played til March 10, 2019.